Northern flying squirrels are about 30 cm in length and have broad flattened tails. The fur on their back is a cinnamon brown and they have white bellies. The large eyes of flying squirrels facilitate effective night vision. This is necessary because, unlike their more commonly seen cousins, these squirrels hide away during the day and become active about an hour after sunset. Habitat: Northern flying squirrels prefer older-growth coniferous forest, while Southern flying squirrels prefer older-growth deciduous forest. Good tree cover is important to enable gliding between trees. Old trees and snags (dead or dying trees) are important nesting sites for flying squirrels. Diet: The northern flying squirrel is an omnivore. Therefore it eats nuts, seeds, berries, insects, tree buds and sometimes eggs or nestlings. Habitat loss (deforestation) is one of the main threats to flying squirrel populations. Clear-cutting that creates large open spaces too expansive for gliding across is particularly detrimental. Nesting sites are another important consideration in the protection of flying squirrel habitat. If you live in a forested area, you can help flying squirrels by building nesting boxes for them. Notes: Flying squirrels, despite their name, are actually incapable of true flight. However, a loose fold of skin, which stretches between their front and hind legs, enables them to glide for distances of 20 metres or more. It can be very difficult to distinguish northern flying squirrels from southern flying squirrels. 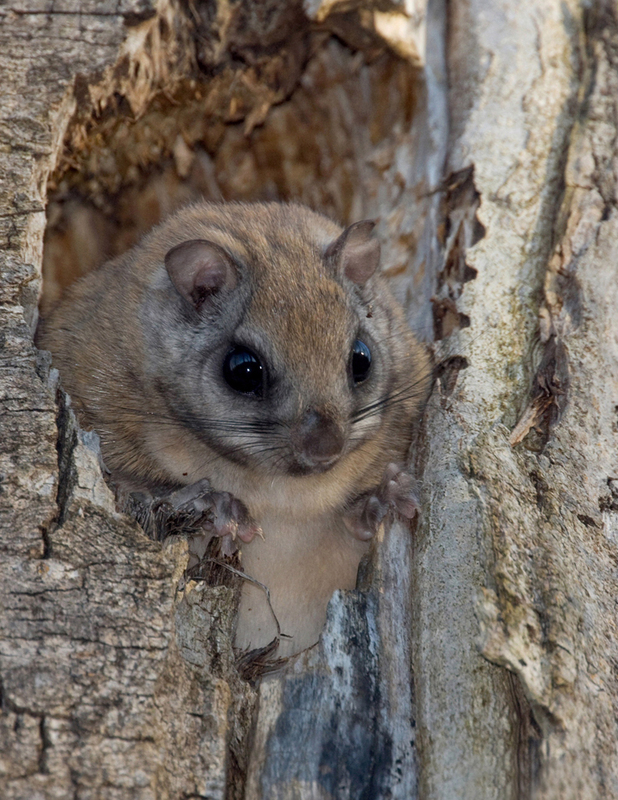 Although northern flying squirrels are generally larger, it would be easy to mistake a juvenile Northern for an adult Southern. Southern flying squirrels tend to be greyer, but as colour varies this is not a reliable way to distinguish the two species. The belly hairs of the Northern flying squirrel are white, but turn slate grey at the base (where they meet the skin), while those of Southern flying squirrels are white to the base. However, this too can vary somewhat. DNA analysis is really the only fool-proof method to tell the two species apart. However, this is not feasible for most people. Instead consider a combination of belly hair at base, species distribution, and forest type to get a reasonably accurate determination of the species. Most flying squirrels don't live longer than four years mostly due to their many predators. These include native wildlife such as owls, hawks, martens, and weasels, but domestic cats have also added to the problem. If you have a cat, you should keep it inside or on a leash. Free-roaming cats, especially those left to roam after dusk, are serious predators of flying squirrels.